The following article taken from the ‘CLEVELAND LEADER’ of Wednesday, 22 July 1896 is a tribute to the early Manx settlers in Ohio, when the city was but a village. In a small way, the Qualtrough family played their part. "From the tiny Isle of Man came one of the most valuable ingredients of Cleveland’s population. It was the contribution of the people which began in the village period (of Cleveland). The number of Manxmen in and near Cleveland is estimated to be several thousand. The proportion of the entire population of the city is not large but it constitutes a quota as decided in its effects as it has been beneficial. They were noteworthy for the readiness with which they became identified with the interests and the order of their new home, rooting themselves quickly and firmly in the land to give more than they should draw from it. They were industrious, intelligent and strictly temperate. Mans immigration began in the third decade of Cleveland history, while the place was yet a village of a few hundred people and has been continued to the present (1896). The honour of being the first Manxman to visit Cleveland lies between Dr Harrison and Kelly Gawne and the latter was at least the first to remain. He was with the British army in the war of 1812 and through some connection with a duel while in the army, was at New Orleans and he had occasion to come northward individually and reacted positively to Cleveland. Dr Harrison was a surgeon in the British navy and traveled extensively about the world. In one of his trips prior to 1820, he stopped at the mouth of the Cuyahoga River (on which Cleveland is built) and was greatly impressed with its future prospects by reason of its environment and strategic situation. His accounts of the locality on his return (to the Island) directed attention to it as a desirable goal for emigration and in 1824 one family came out, by mistake settling in Painsville, Ohio. William Kelly and his family, in 1826, came on and settled in Newburg township and he was shortly followed by William Caine. In the years 1827 and 1828 over a hundred families settled about what is the "South End", more particularly from Union Street southward. It came to be true that one could pass for five or six miles in a line through Newbutg town and have Manx farms on either hand all the way. Among those who came with the movement of 1827 were the families of Mr Kerruish, Rev Thomas Corlett and Thomas Quayle. The Manx people of Cleveland were mostly Methodists in their denominational following and in the early days public services were held in the Gaelic language near Warrensville. One of the earliest preachers was a Methodist minister – Pastor Cannell – who exercised great influence and who held services in his own log house and later led in having a church building erected on the Corlett farm. He was 73 years old when he came to America. A large proportion of the membership of the old Wesleyan Methodist Church which existed on Euclid Avenue years ago were Manx people and many of them are members of the First Methodist Church. A relief society has been in existence among the Cleveland Manxmen for the past forty-five years and some years ago possessed a literary department. 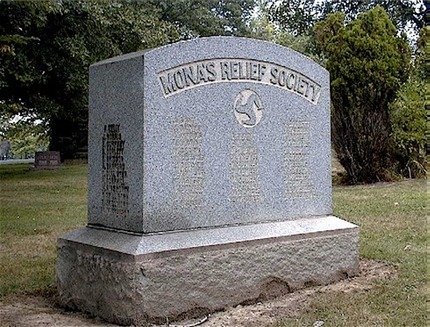 Another organization is Mona’s Mutual Benefit Society. Some of the representative Manxmen of Cleveland, besides those mentioned are W.S.Kerruish, a prominent attorney, James Christian, once a superintendent of the infirmary and well known as a local preacher, John Gill, a member of the Ohio Legislature, the late Judge Sherwood, M.G.Watterson, once county treasurer, the late T.J.Carran, a member of the Ohio Senate and W.R. Radcliffe, well known before his death for connection in various capacities with the city government". J. QUALTROUGH appears amongst the list of names. This is Joseph Qualtrough, (aka Ambrose Joseph Qualtrough) who left the Isle of Man in the early 1890’s to seek a life at sea in the US Navy. He left a wife and daughter back on the Island who he never saw again. It appears he never got his wish to go to sea either. It is believed he died in the 1890’s. The diary reads: "In the afternoon we went to find Highland Park Cemetery for that is where my father is buried. We found the grave or graves for there are 56 others resting there. The bodies had been exhumed and taken from Woodland Cemetery to the Manx ground at Highland. The monument was sweet and yet massive. There was something that suggested strength about it and yet one could only think of something sweet and simple. It was a beautiful moment and I laid there some sweet peas from Harry’s garden. I had carried them from Madison, Wisconsin and had worn them in my belt most of the way, at times giving them something to drink whilst I was eating. They looked pretty and were alive and sweet when I laid them there." Another QUALTROUGH also settled in the Cleveland area with her husband and family. She was Ann Qualtrough, daughter of Richard Qualtrough and Anne Moore Qualtrough of Arbory, Isle of Man. Ann Qualtrough was baptized in Arbory on 12 August 1823. She married Thomas TAUBMAN in Rushen on 23 December 1848. The couple moved to America where some of their children are listed as having been born. However the family must have returned to the Isle of Man at times as each is listed as having been baptized in Rushen, Isle of Man. died in Cleveland, Cuyahoga Co, Ohio in 1908.